Whether you’re looking for a perfect family vacation, a romantic getaway or a wild adventure, Crete is the right place for you. Greece has a lot to offer. From delicious cuisine, rich history and breathtaking beaches to islands which leave no one unimpressed. Crete is without a doubt one of them. You’ve heard of Santorini, and you’ve heard of Mykonos. However, there’s so much more to Greece. Recently, I had the pleasure of visiting Crete, and needless to say, I was speechless. We were there for ten days, and I have to say it was definitely not enough. Each day had a different vibe, and each beach has its story. You’ve probably heard of Elafonisi. It was a hidden gem visited only by locals until it was named one of the 25 most beautiful beaches in the world. From that point on, the secret was revealed to people all over the world. It became every traveler’s dream destination. As we go through the article, I’ll be sure to share my favorite attractions with you as well as some tips on how to maximize your Cretan experience. One of the most important things you need to take care of before you leave for your vacation is to rent a car. If you are going to Crete, this is a must. Crete is a large island with so much to offer, and if you spend your entire vacation in one place, you will miss out on a lot. Seriously, do not make the mistake of not renting a car there. What every renting agency on Crete will tell you is that you’re not allowed to take the car to Balos, and other country roads which are in bad condition. This definitely makes sense. A lot of roads there are very narrow, so be sure to follow the map, and drive carefully. You can find a lot of car rental agencies online, or you can contact your hotel and ask them to take care of that. A lot of hotels on Crete, or tour guides will offer this service, but it’s cheaper if you take care of this before your trip because it will be a lot cheaper. As we got into our accommodation, we sat and created a plan for the next ten days. Of course, sometimes going spontaneously will take you to some of the most beautiful parts of Crete, however, you want to make sure you don’t miss any of the sites which are famous for their beauty. The first destination on our list was Preveli. And what’s so special about Preveli is the palm forest. I have to be honest and say that the beach was not spectacular, but the palm forest was absolutely amazing. If you ever find yourself in Crete, make sure you visit Preveli. An absolute must was Balos. A place which cannot be described. You have to see it, in order to experience the beauty of this place. When it comes to Balos, many dwell on what to do about transportation. Should you board the boat in Kissamos and arrive directly to the beach, or go by car, it’s up to you. If you decide to drive there, be extremely careful, and prepare for a long walk from the parking to the beach. However, the view is definitely worth it. It’s absolutely breathtaking. Make sure to include Elafonisi as well. Have you ever seen pink sand? No? Well, this is your chance. Not only is the beach, and the water beautiful but the way the sand changes color as the sun goes down is jaw-dropping. It’s a sight to see. Matala. An absolutely wonderful experience. The town itself is amazing, with its hippie vibe, delicious food, and great beer. And then, the Red Sand beach. In order to get to the beach you have to go by foot across a hill, but believe me, it’s absolutely beautiful. Even though each of these beaches has something unique, I have to say the Red Sand beach was my favorite. I don’t know why. Only a few people were there, there were waves, and the sand was simply perfect. And the sunset. Wow! My favorite memory about the Red Sand beach was the sunset. Definitely add Seitan Limania to your list. This beach is something different. Beautiful white rocks and clear blue water will amaze you. It’s a unique experience and is definitely worth visiting. Seitan Limania has adorable residents which are there all the time and will make your visit a lot more interesting. I’m talking about goats. You will see a lot of goats when in Crete, but when at Seitan Liamnia, wherever you turn, you’ll see one. They’ll also come up to you and check if you have any food with you. Hilarious. Crete has so many wonderful museums, churches and historic sites you definitely have to visit. The first one on our list was Knossos. Knossos is the largest Bronze Age archaeological site on Crete and has been called Europe’s oldest city. There’s so much to see, and it’s a really wonderful experience. You absolutely have to visit the Arkadi Monastery. It’s a beautiful place with such a sad history. Located 23km to the southeast of Rethymnon, this Eastern Orthodox monastery offers its visitors a unique experience. Both Heraklion (the Capital of Crete) and Chania have amazing museums with different themes. If you find yourself in these cities, make sure you visit the Heraklion Archaeological Museum in Heraklion and the Maritime Museum of Crete in Chania. Of course, there are many aquariums which are worth visiting. My favorite was the CretAquarium Thalassokosmos, which offers a unique 3D experience. Crete has amazing food, and the portions are HUGE. It doesn’t matter which restaurant you choose, you will not be disappointed. The food is delicious, the portions are huge and the prices are normal. Oh, and the best thing — almost every restaurant in Crete will give you a free dessert or a free drink when you’re done with your meal. How nice is that? Make sure you try Antikristo- Αντικριστό. It’s Cretan number one food when it comes to lamb, and it’s really delicious. 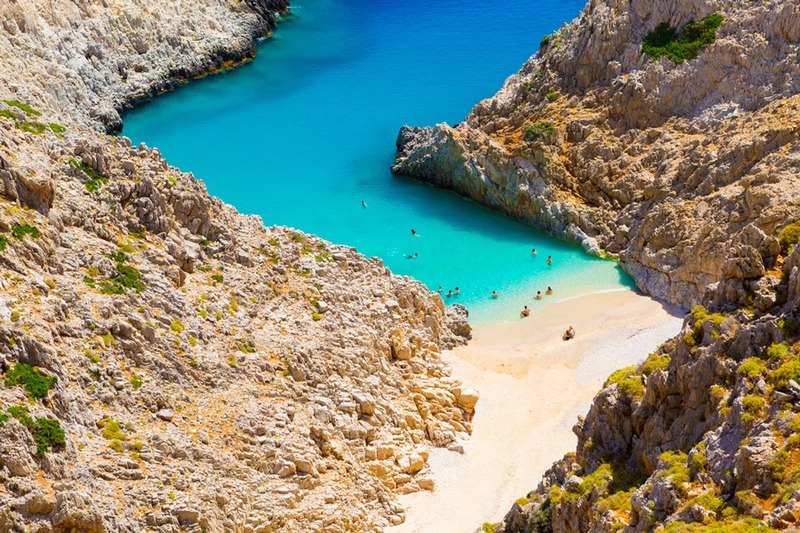 Whether you’re an adventure seeker or a beach bum, Crete is the right choice for you. It has everything you need for a perfect vacation, and after visiting it, you’ll definitely catch yourself daydreaming about going back. Trust me, I’m talking from experience.